It doesn’t get much easier than a one-pot, delicious, economical, healthful, weight-loss-promoting bowl of a Russian-Polish peasant food. Just how good is this soup? I challenge you to eat one small bowl and not go back for seconds or thirds. It is surprisingly, may I say astonishingly good considering its humble ingredients. Then again I am half Russian (or Polish, depending on the year territory was conquered). This is a recipe to make anytime you want a quick meal full of super-vegetables and the weather is chilly, like now in some places, or when you want to unplug your sinuses. 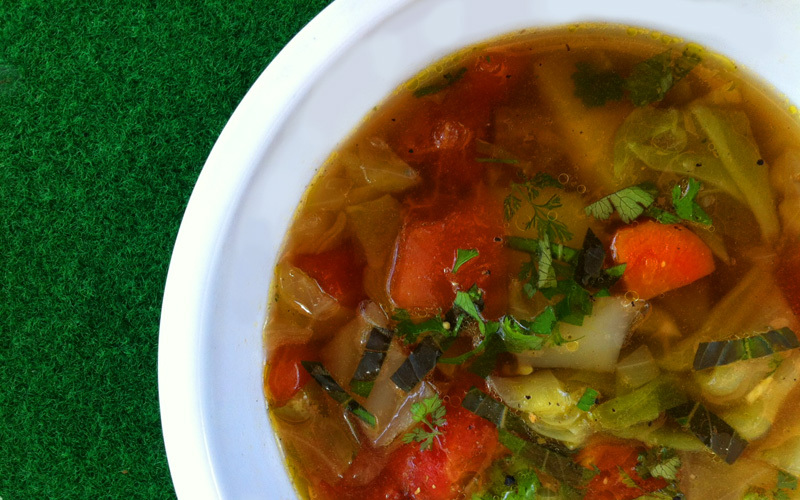 It’s got everything you need to fight those microbes: cabbage, garlic, onions, tomatoes and carrots. It’s bathed in a peppery vegetable broth and it’s ready in minutes. Cabbage is one of the healthiest vegetables on the planet and we should all eat a cup and a half of cooked or raw cabbage or other cruciferous vegetables like kale, chard and broccoli 2-3 times per week. How are you doing on that score? Me neither. But I’ll bet you’re thinking about it right now and that’s great! Add some lentils, small cubes of tofu or some white beans if you’d like to boost the protein content of the soup. Couple the soup with a warm baguette smeared with Earth Balance buttery spread and you’ve got a total vegan dish; change that to butter and it’s vegetarian. White pepper — at least a quarter teaspoon but use more if you like. Black pepper works but I like the white pepper because it’s got a nicer burn and is invisible. Minced fresh herbs if available as garnish: parsley, basil, cilantro, etc. 1 – Chop all vegetables and put them aside in prep bowls. 2 – In a large soup pot, heat olive oil over medium heat and saute onion and garlic until translucent, about 5 minutes. 3 – Add broth or water and bring to a boil. Once the water is hot, add a few teaspoons of that hot water to the bouillon cubes and break them down with a fork, then add to the soup pot. 4 – Add salt and lots of pepper. You can also add a teaspoon of Mrs. Dash seasoning, a pinch of cumin, or even additional hot pepper flakes or hot sauce here to further spice things up. Make sure to taste after any additions. 5 – Add potatoes and carrots, allow to boil on medium heat for about 5 minutes. Add cabbage and continue to simmer for another 15 minutes. Taste vegetables for doneness, add tomato, taste the soup for spices. Sprinkle herbs on top. Ladle into bowl. Serve with the bread.